(Photo: © Peter Kenny)The United Nations in Geneva, where the UN Human Rights Council is based, photographed on Feb. 10, 2017. A United Nations committee has voted to deny the accreditation of religious freedom advocacy group Christian Solidarity Worldwide after deferring the group's application since 2009, but Britain has said it will fight against the vote. The United Nations Committee on Non-Governmental Organizations voted Feb. 3 to reject CSW's application for official UN accreditation. The UK Mission to the UN will be appealing the decision to the ECOSOC body that oversees the NGO Committee, said CSW, a group that is renowned for its reporting of persecution of Christians. CSW described the decision as "highly questionable." Mervyn Thomas, CSW's chief executive, said the organization is "extremely disappointed" by the NGO committee's decision. 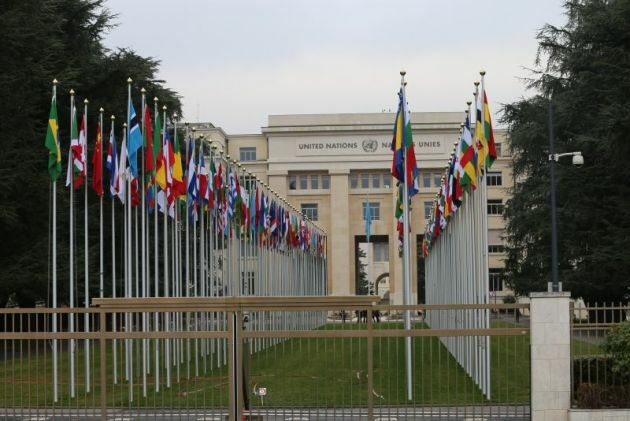 "It is deeply concerning that the UN Committee on NGOs, the very entity which is tasked to facilitate NGOs access to the UN, is instead actively blocking civil society access to the UN. "We believe that this decision is effectively an attempt to silence CSW and undermine the promotion of freedom of religion or belief within the UN system." Britain's deputy ambassador to the United Nations, Peter Wilson, said Feb. 9 he was "deeply disappointed" that the 19-member committee that accredits non-governmental organizations voted to reject the U.K.-based group's application. The organization "does important work in protecting freedom of religion or belief," he said, adding, "The NGO committee should work to enhance, not restrict, the space for civil society participation in the U.N."
CSW said it applied in 2009 for consultative status with the UN's Economic and Social Council (ECOSOC), an official UN accreditation and held by numerous religious affiliated organizations. This would have given CSW access to the key human rights advocacy platforms including the Human Rights Council and General Assembly. The four nations that voted in favor of CSW's accreditation were the United States, Greece, Uruguay and Israel. Some of the countries that voted against the application included China, Sudan and India, which have track records of persecution against Christians, The Christian Times reported Feb. 10. Other countries that opposed CSW's accreditation were Cuba, Pakistan, South Africa, Iran, Sudan, Turkey, Venezuela and Nicaragua. Russia abstained while Azerbaijan, Guinea and Mauritania were absent. CSW has already expressed plans to appeal the decision. CSW said it was a "highly questionable decision" when the NGO committee voted 11 - 4, with one abstention and three absent, to deny CSW's application. The NGO Committee comprises 19 UN member States. It is tasked with considering applications for consultative status by NGOs and facilitating civil society access to the UN. The vote on CSW's application was called by the Permanent Mission of Greece to the UN. Its representative Georgios Pouleas said: "Greece attaches major significance to promoting religious tolerance and countering any discrimination based on religion or belief. "Christian Solidarity Worldwide has over three decades of experience in advocating freedom of religion or belief and engages regularly with the United Nations mechanisms providing valid evidence-based analysis. Greece strongly supports CSW and we believe that their contribution to ECOSOC would be valuable and meaningful." NGO Committee members deferred CSW's application since 2009 by asking more than 80 questions about CSW's work. Despite providing timely and comprehensive answers to all questions and attending NGO Committee sessions several times, CSW's application continued to be deferred, hampering CSW's opportunities to promote the right to Freedom of Religion or Belief at the UN, the organization said. During the NGO Committee session on Feb. 3, CSW's application was supported by Martin Shearman from the UK Mission to the UN in New York. He said: "The work of CSW is rooted in the UN Charter and the Universal Declaration of Human Rights. They support the right of all to freedom of religion or belief. "For this Committee not to recognize an NGO that is committed to defending the rights of all, regardless of their religion or belief and, in particular, to making full and active use of UN mechanisms, including the UPR, is counter-productive and indefensible." Other religious affiliated groups in ECOSOC include: the World Union of Catholic Women's Organizations from France; the Joint Women's Programme-Christian Institute for the Study of Religion and Society (India); YWCA of India; Islamic Women's Institute of Iran (Iwii), Iran; Muslim Women Researcher's Organization (Iran); the Women's International Zionist Organization of Israel; Caritas Internationalis (Italy); Word of Life Ministries International-Word Of Life Christian Fellowship (Jamaica); Commission of the Churches on International Affairs of the World Council of Churches, Switzerland; the Swiss-based World Alliance of Young Men's Christian Associations; the Swiss-based Lutheran World Federation; the Swiss-based World Student Christian Federation; World Alliance Of Young Men's Christian Associations (Switzerland); the World Fellowship of Buddhists, based in Thailand; Adventist Development and Relief Agency (USA); American Jewish World Service, Inc. (USA); the U.S.-based Baha'i International Community; Catholics For A Free Choice (USA); Church of Jesus Christ of Latter Day Saints (USA); Franciscans International (USA); Greek Orthodox Archdiocesan Council Of North And South America (USA); Hadassah, the Women's Zionist Organization Of America, Inc. (USA); Jewish Council For Public Affairs (USA); Women's League For Conservative Judaism (USA); World Conference On Religion And Peace (USA); Medical Mission Sisters (Society Of Catholic Medical Missionaries, Generalate, Inc.), UK; the World Muslim Congress (Motamar Al Alam Al Islami), Pakistan; Muslim World League (Saudi Arabia) and others.